OCMC News - October is Support a Mission Priest (SAMP) Month! October is Support a Mission Priest (SAMP) month. Please prayerfully consider supporting the clergy and their families that are working to grow the Church in mission lands while ministering to the needs of the people they feel called to serve. We like to dedicate every October to our Support a Mission Priest (SAMP) program. 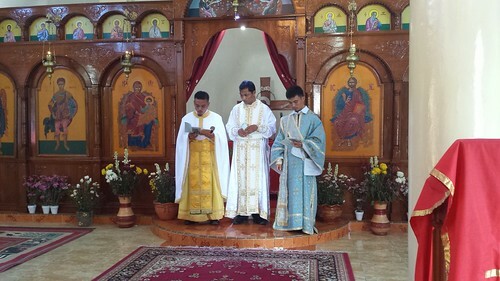 Through this program, we’re able to create a valuable connection between all of you and over 300 priests in mission fields all around the world. SAMP gives individuals and communities the opportunity to directly reach out and impact the lives of those mission priests by providing them the support they need to continue their ministries. All it takes to support each priest is $50 per month, or $600 per year. Over the course of this month, we’re hoping that you all will help us meet our goal of $2,400 - enough to support 4 mission priests for an entire year! We currently have 376 priests in the SAMP program, spread out across 16 countries. Each one of these priests is laboring in Christ’s vineyard, working in a difficult environment to raise up the Church, and often with little support. Over the next few weeks, through our social media communications as well as these weekly articles, we’ll be giving you a glimpse into their lives, their work, and their ministries. And if any of them resonate with you, please share their stories with your friends and family! Simply getting the word out to more people can go a very long way for these ministries. We look forward to sharing these stories with you, and to forming new networks of support in the Church. All it takes is $50 per month to make a huge impact in sharing the Gospel around the world, and we’re looking forward to the good work that can come out of this! Please also keep all of our mission priests in your prayers! Prayer will go a long way for all of their ministries. We’re excited for SAMP month, and we hope you are too!